By now you should be acquainted with Troma, that oh-so exquisite branch of shameless horror that recycles footage and plasters DVD releases with painful introductions with fart-dubs and self-appointed scream queens. 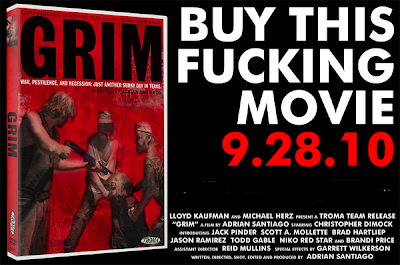 Grim is a recent film picked up for distribution by Troma, which more-or-less means that director Adrian Santiago gave the rights to his film away for a very small amount of cash, if any at all. Now, Grim falls alongside many of the classic exploitation films for a simple reason; the exaggerative marketing ploy. Branded across the back of the case, in big, bold letters, reads "The Most F*cked Up Film of the Year", a quote in which no person admits stating. We've all seen this used before but to a similar comedic effect, whether it be Banned in 492 Countries! atop the Isle of the Damned poster or the better known Cannibal Ferox purportedly banned in 31 countries. This path of methodical marketing works wonders, especially if the film actually contains a fraction of what it reports. Sadly, Santiago's Grim offers nothing apart from character impotence and a hack-job attempt at recreating Mexican uprising ala Machete. Grim opens up with a shoddy pick-up truck speeding down a long, lonely desert road in Texas. In the bed cowers a family with gun sights aimed down upon them. For reasons unclear at first, the parents are brutally executed and the boy is left with a nasty pipe wound on his forehead. Found by an ex-lawman, Nicolas Grim is raised a proper boy. Or so we're left to assume because Grim has a nasty habit of skipping large chunks of time and then hides behind an alleged dystopian atmosphere hinted at through contrived pieces of dialogue. Once Grim is of age he reflects the murderous compassion held by his parents killers when they return to take the lives of his adopted guardians. Grim soon discovers that the militia held responsible for such savagery is a rogue union known as the United American Brigade. 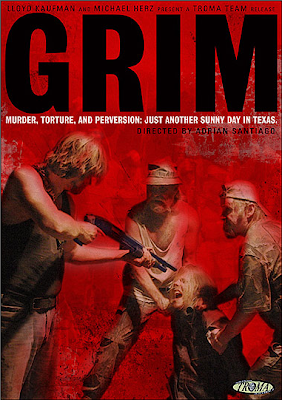 From here Grim escalates into third-rate slaughter in the terrible form of digital video. Santiago's priorites should be ashamed, all talk and no aesthetic. Not once does Grim resemble a project higher in class or charm than a student film. Simple scenes of gunshot wounds are turned into a fallacy all its own when 2 foot long streams of tomato soup blow out the back like a renegade squib. Not to mention the daft production in which a simple set piece of obstinate musing falls victim to relentless set echo. When you tally what Grim would hope to achieve and contrast it to its successes, this would be the point at which you'd look down to discover an empty looseleaf page. 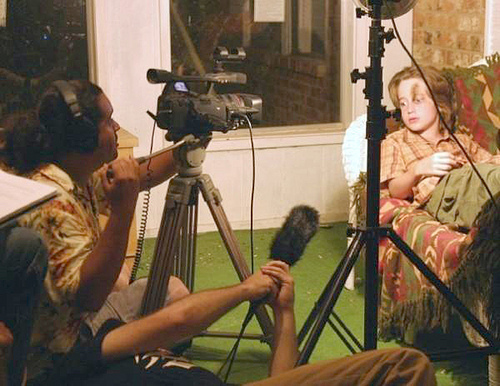 Grim is stubborn filmmaking at its worst. Juggling through comedy, mexploitation, thriller, and post-USA, you begin to realize that all of these classifications are simply too good for Grim. Whatever Santiago had in mind for Grim withered before the film could even take off into the ignorant land of postmodern exploitation garbage it hoped to populate. I can safely refute the existence of aspiration in Adrian Santiago's future career in film. If he hopes to achieve anything in the business of horror at all he must set aside his atrocious digital dreams and rework his childish ideologies on a better format. 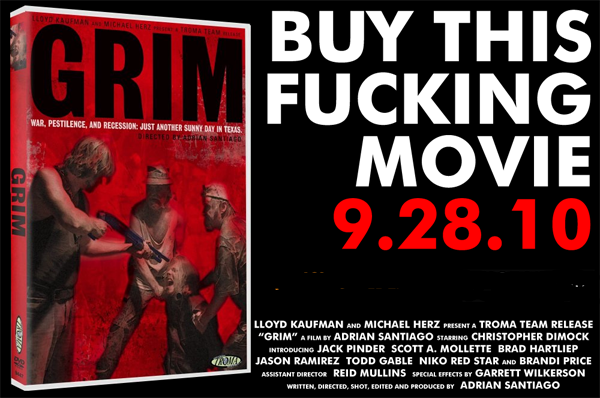 Doomed economy or not, Grim is convicted for a litany of transgressions - crimes against cinema. The likes of which I could never forgive. What's more is that Grim manages to be unspeakably boring. Don't take my word for it, simply pick up a copy for yourself @TLACULT and attempt to muster appreciation for Grim's diseased cause. Unless, of course, you happen to be a purebred film masochist. Positively speaking, Troma is getting quite skilled at masking their products under beautiful cover art. I've always had an aesthetic fascination with art & marketing and that is about all that can be said for Grim.